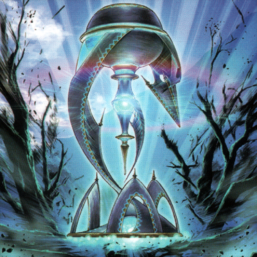 "World Legacy - "World Chalice""
"World Legacy", known as "Star Relic" (星（せい）遺（い）物（ぶつ） Sei'ibutsu) in Japanese, is an archetype of DARK Machine monsters introduced in Code of the Duelist. It is related to, as well as supports, the "World Chalice", "Krawler", "Mekk-Knight", "Knightmare", and "Orcust" archetypes; the "Crusadia" archetype and "Guardragon" series are also thematically linked despite not being directly supported. The archetype appears to be based on religious relics, as evidenced by its Japanese name (星遺物 is an homophone of 聖遺物, which literally means "Holy Relic"). Visually, they appear as huge tool-shaped artifacts embedded in the environment, giving them a feel of being ancient and long abandoned, each glowing with one of the colors of the rainbow. As teased in the flavor text of "Chosen by the World Chalice", there are 7 original "World Legacies", which corresponds to the 7 archetypes as shown in the table below. The number 7 is also related to "World Source Regalia Demiurgear", who's based on Demiurge, the creator of the Seven Heavens and the seven Archons. SOFU World Wand 8 Yellow Orcust Orcustrated Babel Staff of Moses/Aaron's rod Towering over the planet's lower atmosphere, likely at the very top of "Orcustrated Babel"